Benzyl alcohol, a preservative in Bacteriostatic Water for Injection, USP has been associated with toxicity in neonates. Data are unavailable on the toxicity of other preservatives in this age group. Where water is required for preparing or diluting medications for use in neonates, only preservative-free Sterile Water for Injection should be used. Intravenous administration of Bacteriostatic Water for Injection without a solute may result in hemolysis. Animal reproduction studies have not been conducted with Bacteriostatic Water for Injection. It is also not known whether Bacteriostatic Water for Injection containing additives can cause fetal harm when administered to a pregnant woman or can affect reproduction capacity. 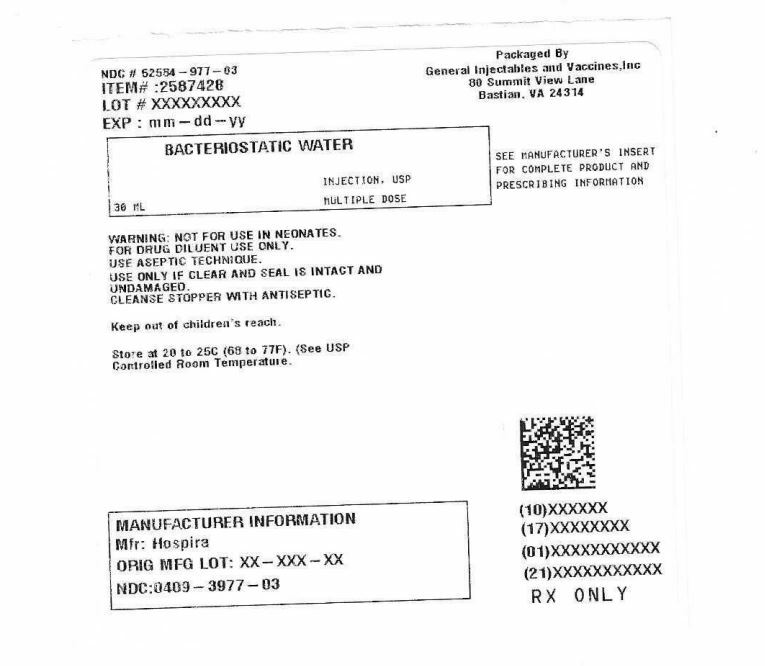 Bacteriostatic Water for Injection, USP containing additives should be given to a pregnant woman only if clearly needed. Use aseptic technique for single or multiple entry and withdrawal from all containers. When diluting or dissolving drugs, mix thoroughly and use promptly. Reactions which may occur because of this solution, added drugs or the technique of reconstitution or administration include febrile response, local tenderness, abscess, tissue necrosis or infection at the site of injection, venous thrombosis or phlebitis extending from the site of injection and extravasation. If an adverse reaction does occur, discontinue the infusion, evaluate the patient, institute appropriate countermeasures, and if possible, retrieve and save the remainder of the unused vehicle for examination. Although adverse reactions to intravenous, intramuscular or subcutaneous injection of 0.9% benzyl alcohol are not known to occur in man, experimental studies of small volume parenteral preparations containing 0.9% benzyl alcohol in several species of animals have indicated that an estimated intravenous dose up to 30 mL may be safely given to an adult without toxic effects. Administration of an estimated 9 mL to a 6 kg infant or neonate is potentially capable of producing blood pressure changes. The volume of the preparation to be used for diluting or dissolving any drug for injection is dependent on the vehicle concentration, dose and route of administration as recommended by the manufacturer. Parenteral drug products should be inspected visually for particulate matter and discoloration prior to administration, whenever solution and container permit. See PRECAUTIONS.